Budapest isn’t always a city that comes to mind when people talk about traveling in Europe. But I am here to tell you that it is extremely kid-friendly, full of history and if you visit end of November till Christmas, you get to enjoy the amazing Christmas Markets! The beauty of the Budapest skyline. We decided to travel during the Thanksgiving holiday, adding a few extra days at the beginning and end. Budapest is one of the European cities that opens its Christmas markets at the end of November, so it was a double win! It is a cooler time of the year, so you’ll need to pack for the cooler weather. If you aren’t familiar with the proper winter clothing, I’ve got a whole post to help you out (including tips for dressing kids). See my Dressing Kids for Winter Weather post. 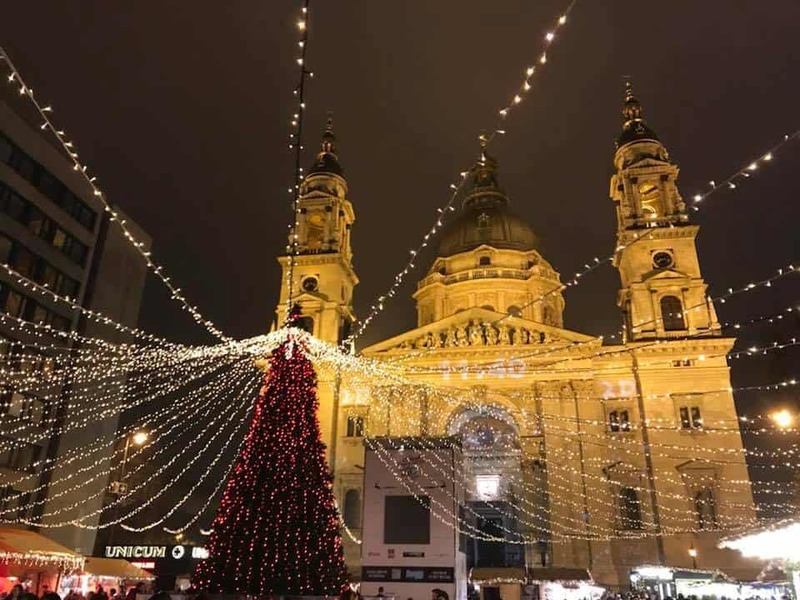 Budapest during the Christmas season is even more charming! We are Airbnb fans and like to stay close to all the major attractions, including restaurants and markets. Here is the link to our Airbnb. Our Airbnb was really nice for a family. The location was key just off the square and next to the Christmas markets. Our host was helpful and even rescued us when we accidentally left our entire bag of souvenirs at the apartment! He quickly packages up the items and mailed them to us in Germany. Phew! He has multiple apartments and can get up transfer from the airport for a nominal fee. If this is your first stay, click this link and you’ll get a discount. I’ll get a referral bonus too. Win-win! If you prefer a hotel, check out booking.com for their list of places to stay. We also frequent bookings properties because they provide support with any difficulties. They also have a rewards program for frequent bookings. 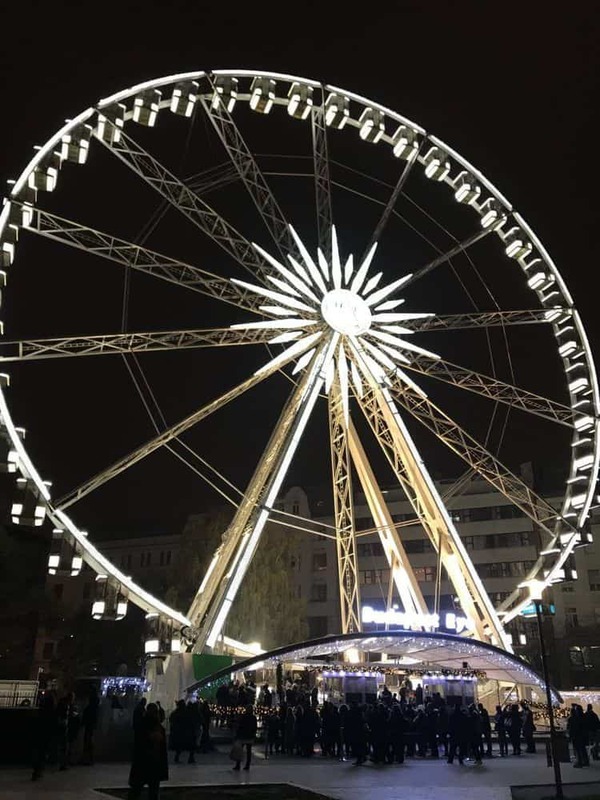 Budapest Eye 2018-A Ferris Wheel on Erzsebet Square, you can see the Ferris Wheel from the Airbnb. We were living in Stuttgart, Germany, so we flew Eurowings from Stuttgart to Budapest. Then we set up a private transfer from our Airbnb hosts. Everything went smoothly! 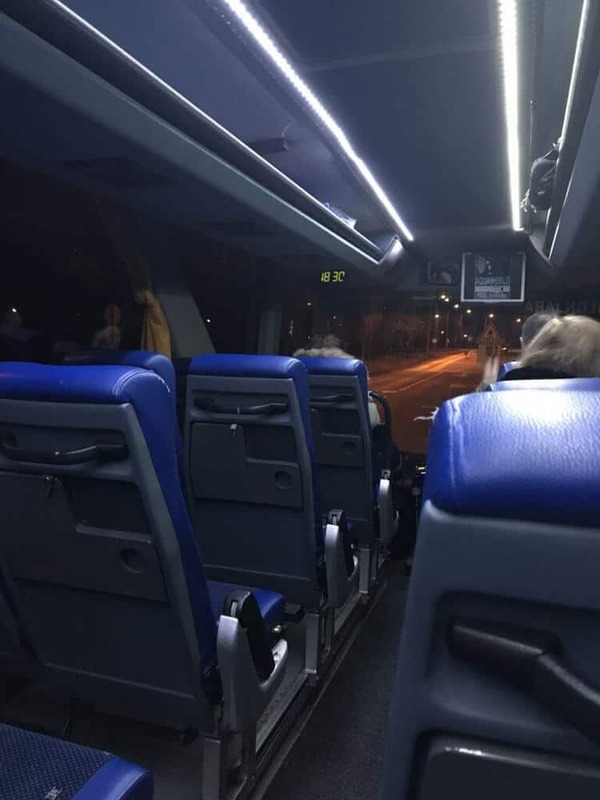 Another option for getting from the airport to the city is the direct bus 100E, you can buy tickets at the BKK automated ticket machines located in the airport. Only the 900 HUF “Airport shuttle bus single ticket” is accepted (under 6 is free). Travel time between the airport and metro station Deák Ferenc tér is 35 minutes. Make sure you validate your ticket right after boarding the bus at the machine. How did we plan our trip? I am a fan of Rick Steves. He provides detailed information on how to string together activities and insider tips. You can check out his book here. Worth the read! I’ve also written up my tips on how to plan a trip, might be worth a quick read. 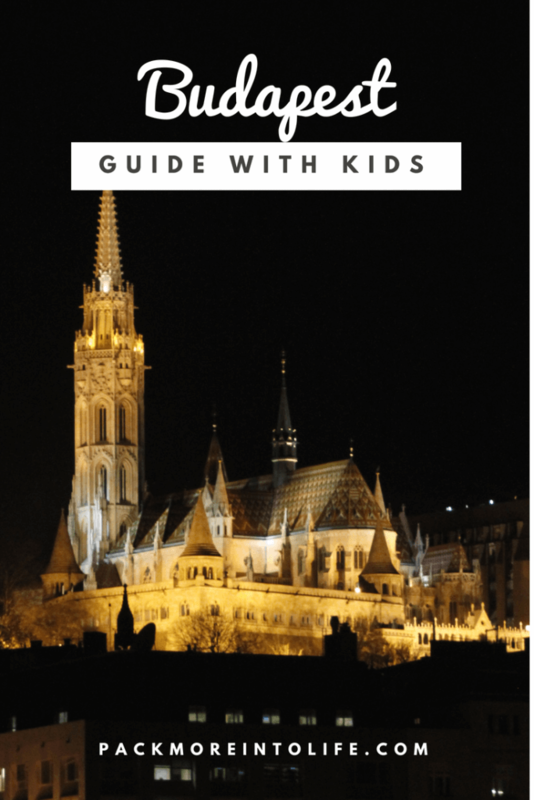 That’s in a nutshell on how we planned our things to do in Budapest with kids. What gear did we bring? Traveling with kids always requires a bit of extra gear. Since the temperatures are around 39° / 29° degrees Fahrenheit, you’ll want to make sure you have the appropriate gear and clothing. For our son, we travel with a City Mini GT stroller. It is one of the most recommended strollers for travel, especially dealing with the cobblestones of European streets. The accessories are never-ending. 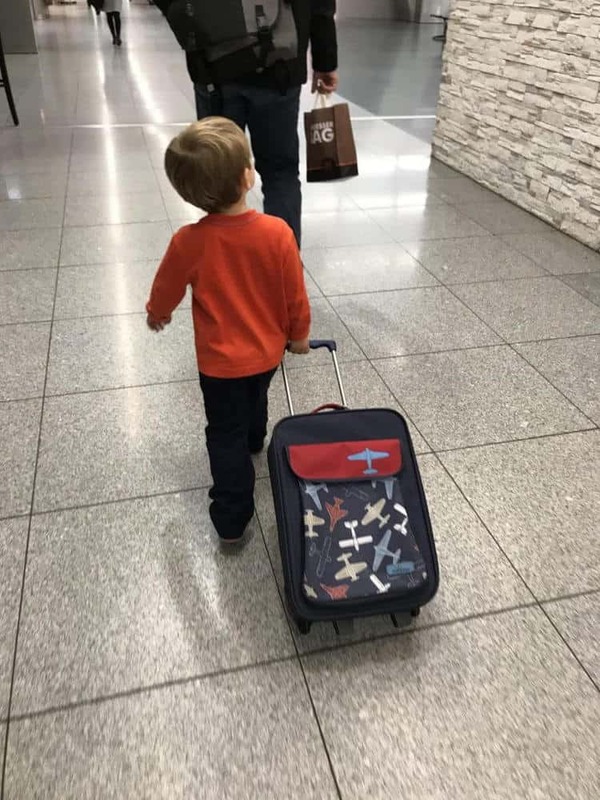 We protect our stroller with all the various flights in this stroller travel bag by baby jogger. 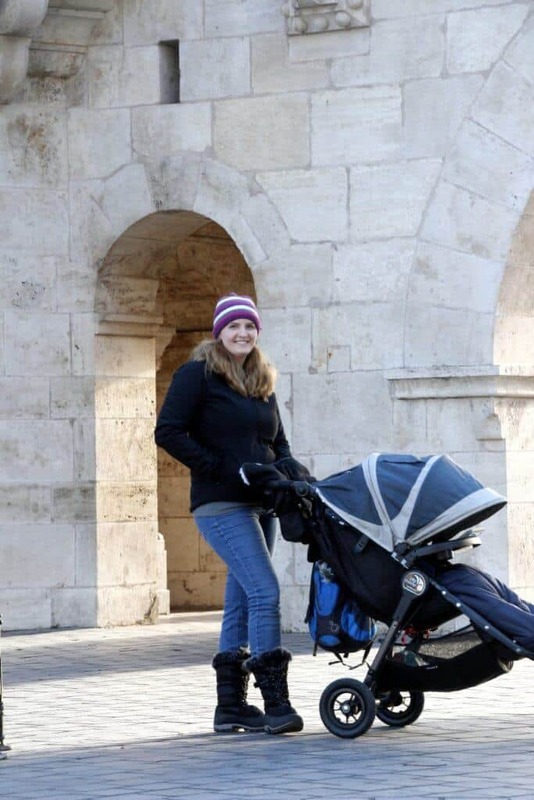 We take the wheels off, fold the handlebars in and then pack all the extra space with our stroller muff, extra blankets, diapers and winter gear. It is padded and has survived at least 20 flights, including a long haul flight to South Africa! We also have a hand muff, stroller organizer, rain cover (doubles as an extra warmth and wind barrier) and huge mom clip for all those shopping bags! Everyone is bundled up warm and enjoying the sights of Budapest. Having the right gear makes all the difference! 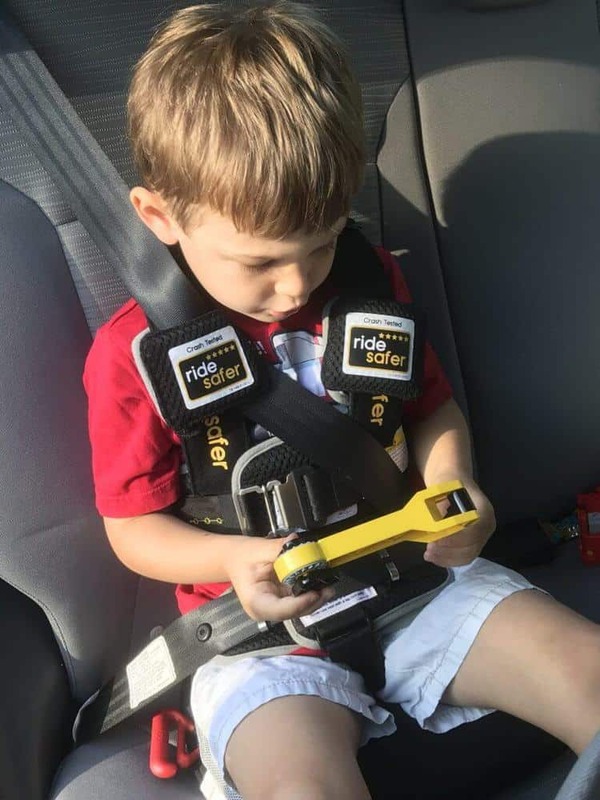 We also traveled with a Ride Safer Travel Harness. If you have a child at least 3 years old and don’t want to travel with a car seat, this travel best is for you! Super easy to use, can fit in a backpack and is great for short car rides (like taxis) and it has passed crash tests. Read more about the company and its safety rating here on their website. We try to travel with the minimum amount of gear as possible. It makes it easier for taxi, train and airport travel. Not to mention a bit cheaper when you have to start paying for bags. Here is my blog on packing tips and tricks. 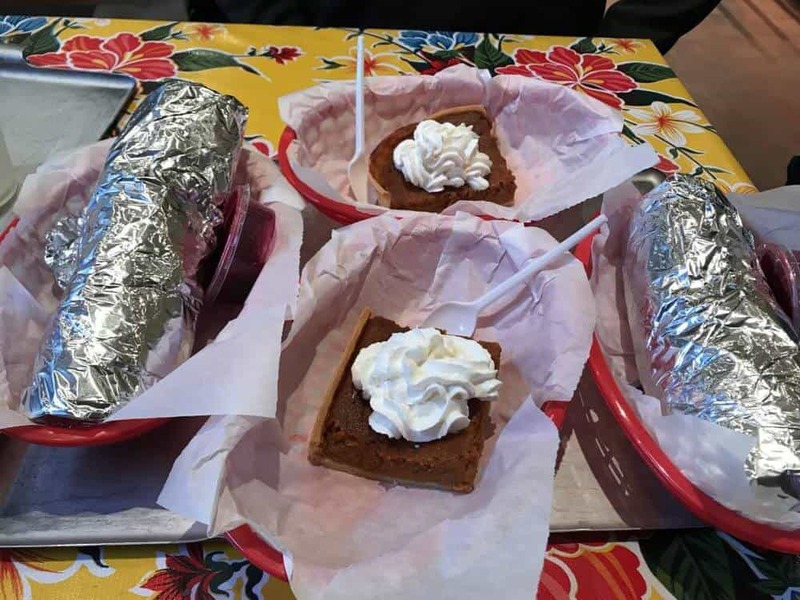 We actually flew on Thanksgiving Day, so after our early morning flight and getting settled into the Airbnb, we headed out for some Thanksgiving burritos from Arriba Taqueria ( Budapest, Teréz krt. 25, 1067 Hungary). It was a nice 20-minute walk from our Airbnb. Oh my gosh, the Thanksgiving burritos are AMAZING!! 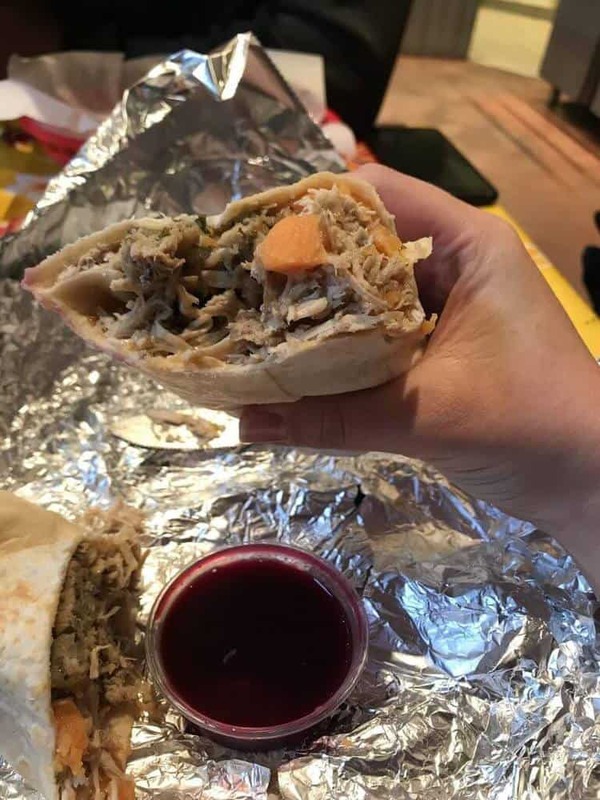 A flour tortilla packed with roasted turkey, savory stuffing, sweet potatoes, and special cranberry salsa. Add a side of pumpkin pie and you won’t feel bad about missing a “traditional Thanksgiving dinner”! Once our bellies were stuffed (literally), we headed to the Miniversum. 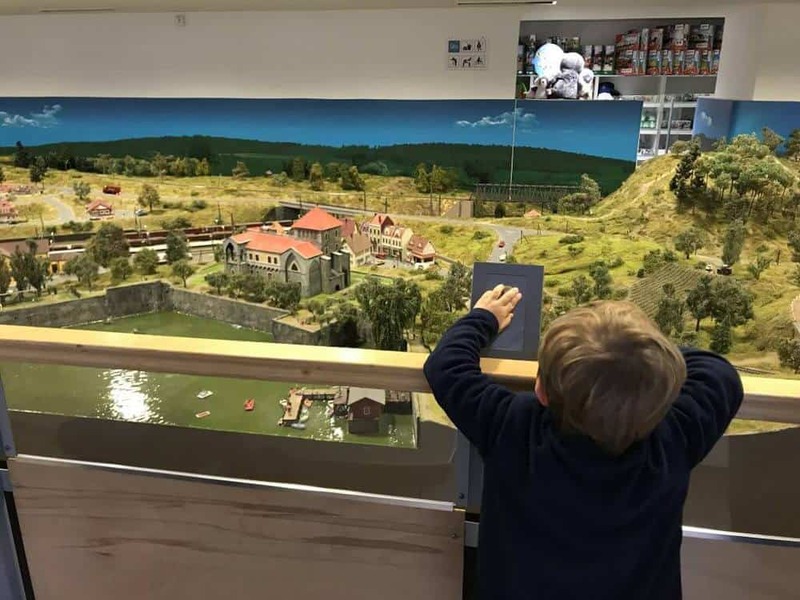 It is a gigantic, beautifully detailed and decorated series of miniature models covering the sights and famous landmarks from Budapest, Hungary, Austria, and Germany. 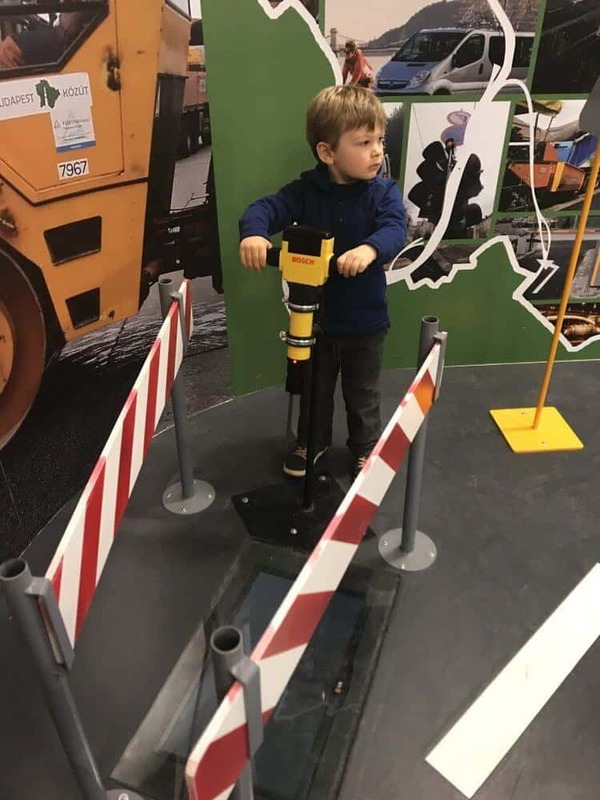 Interactive buttons along the way allowed the kids to control traffic, move trains, animated characters, or make sounds. There is even a small café near the playroom. It was open until 6 pm, so it made the perfect afternoon activity for us. Our son loved locating all the buttons and figuring out what train would move, which light would light up or where the sound was coming from. 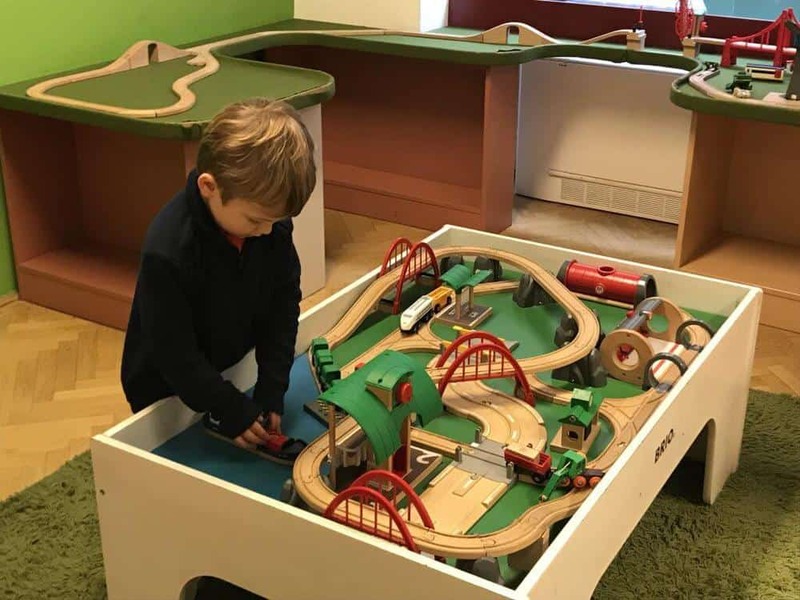 The playroom was also wonderful with a variety of trains to play with. No food is allowed in the play area, but you can eat just outside the doors and still see your kids over the wall. We had to start the trip off right and that meant ALL the Christmas markets. 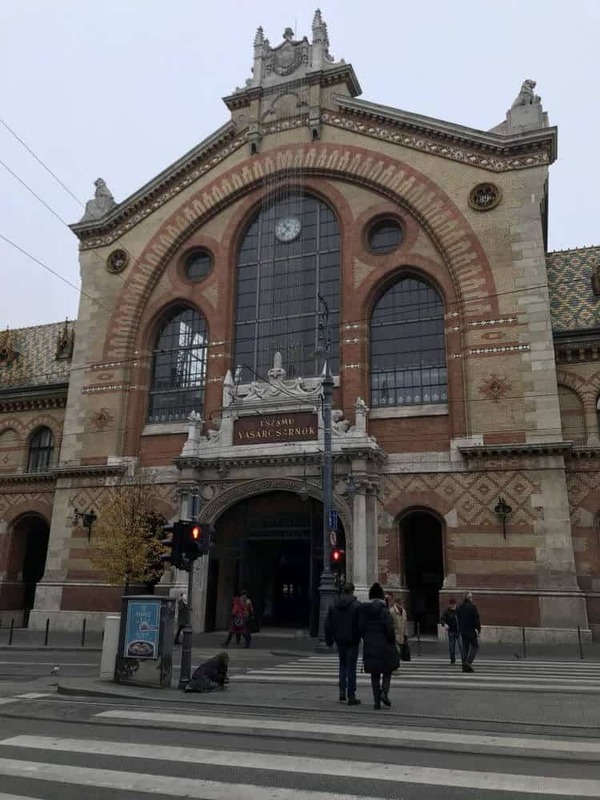 Budapest is a favorite because they have various markets scattered throughout the city. Here is a great website to locate them all. However, if you want all the details about what to buy, eat and drink, check out my Budapest Christmas Markets post. Today was all about exploring the “Pest” side of Budapest. 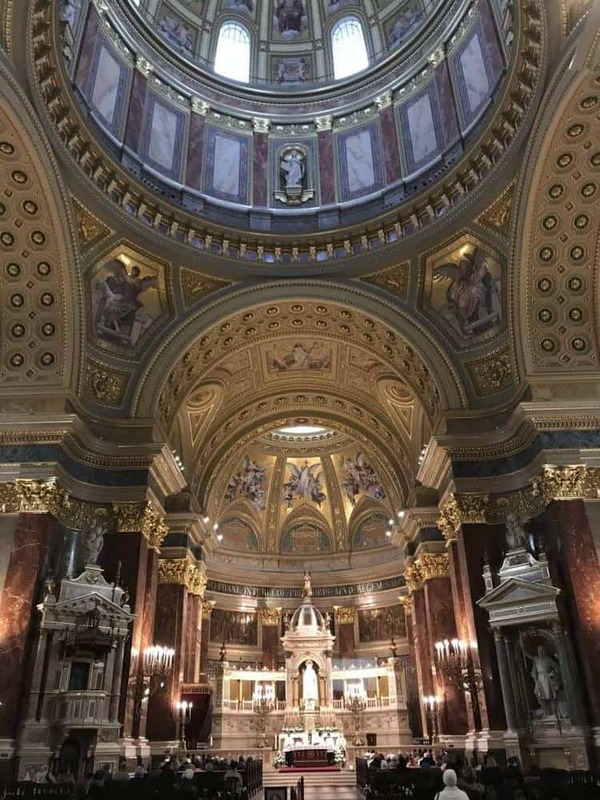 We started at St. Stephen’s Basilica, which is the largest church in Budapest. It was a 7-minute walk from our Airbnb. We enjoyed a walk around the inside and we even got to enjoy some beautiful organ music at the end of our visit during their church services. Then we headed down to view the Parliament building. We arrived just as they were starting their flag hanging ceremony. 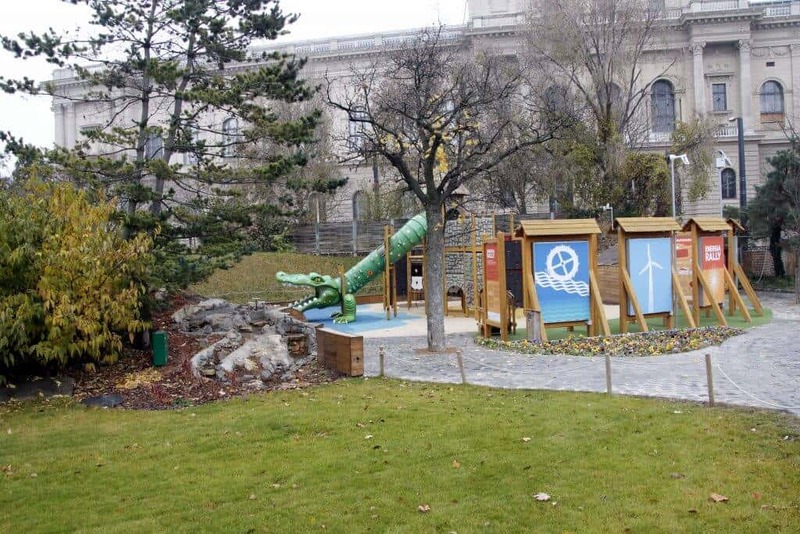 They do have tours inside, but with a toddler, we elected to explore Olimpia Park with its playground just north of the Parliament building. 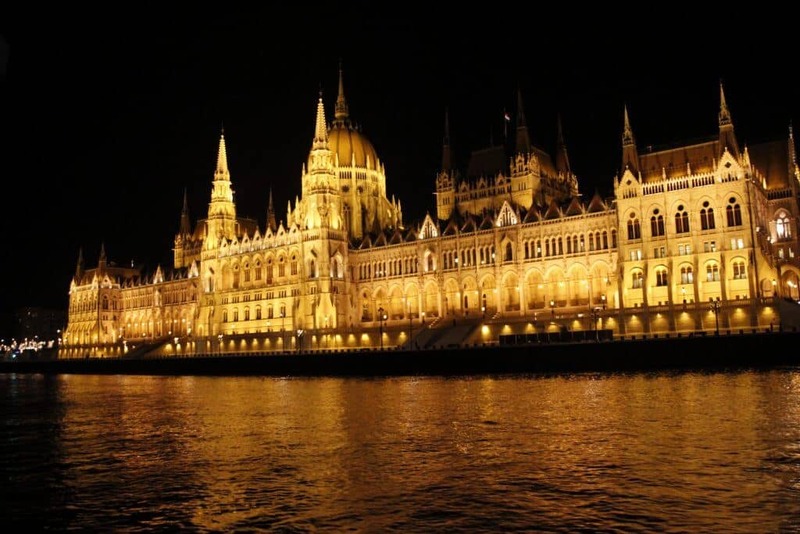 The Parliament was completed in 1902 and 40 kilograms (88 lb) of gold were used. Unfortunately, the government only uses a small portion of the building. Our stomachs started to grumble, which was perfect timing to grab lunch at the Great Market Hall. It was 35 minutes from the Parliament building down by the river. This way you pass the “shoes on the Danube” just past the parliament building. 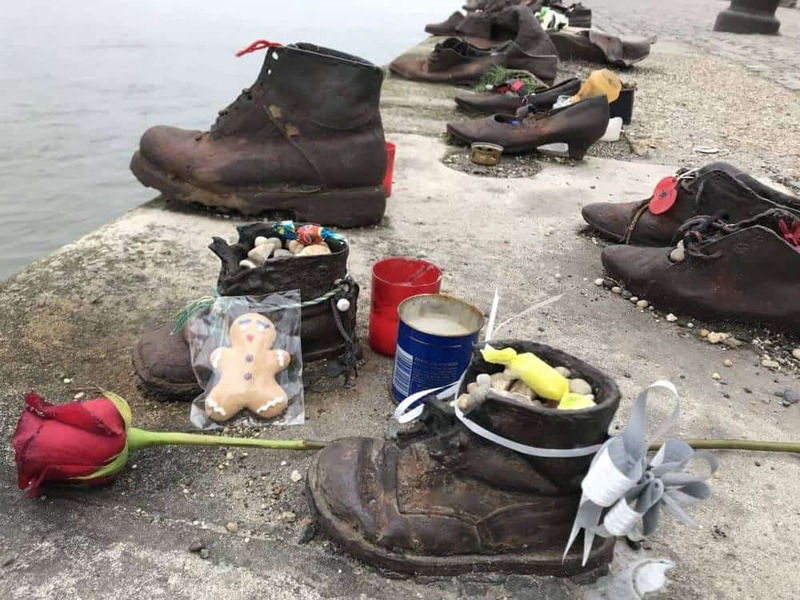 The shoes are here to memorialize the victims killed by fascist Arrow Cross militiamen in Budapest during World War II. The victims were told to remove their shoes and then they were shot, their bodies falling into the river. Once you reach the end of your walk, you’ll see another playground right outside the market hall. Located in the heart of the city, this is where you will find the best souvenirs to take home, including well-crafted toys! There are also food stalls offering delicious local food and seasonal products. 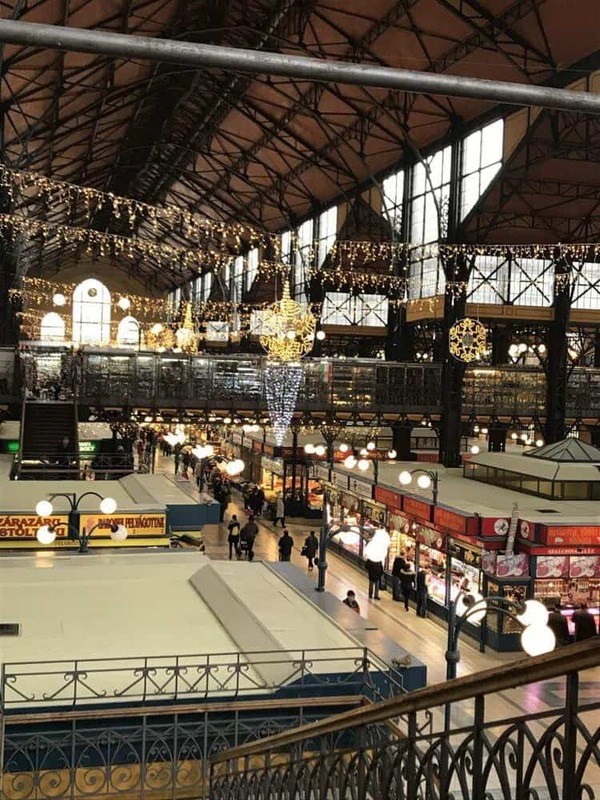 The bottom floor is all foods (I HIGHLY recommend getting paprika here, your whole cooking experience will be different using authentic Hungarian paprika, and you can get it for very cheap). The top is some souvenir type junk, but also typical Hungarian linens, tablecloths, pillowcases, and some other interesting stuff. Some of the stalls/shops have really awesome housewares or decor. We ended up getting some hand-painted eggs as Christmas ornaments. We spotted them a few times and haggled to get the price we wanted. It is a bit tight upstairs, but we still managed with the stroller (City Mini GT). 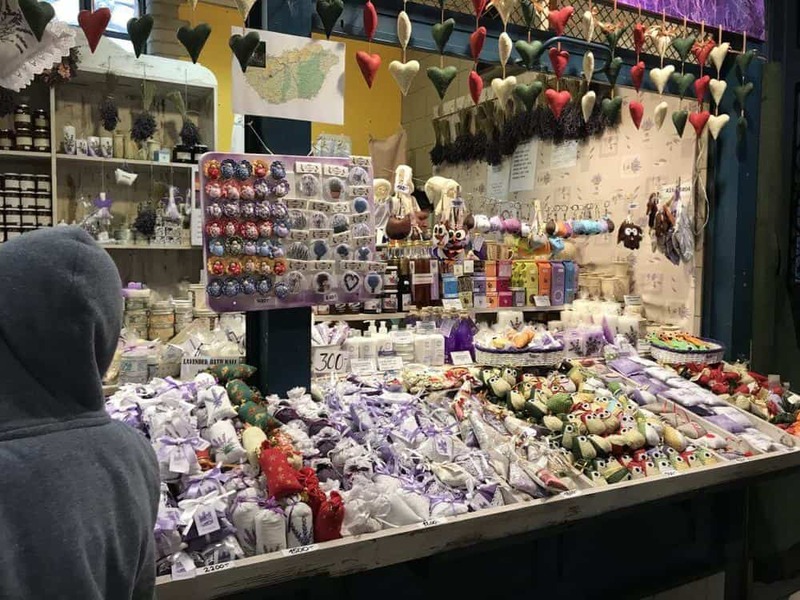 We finish shopping in the market hall, and then headed over to the Jewish Quarter. It was a 15-minute walk. 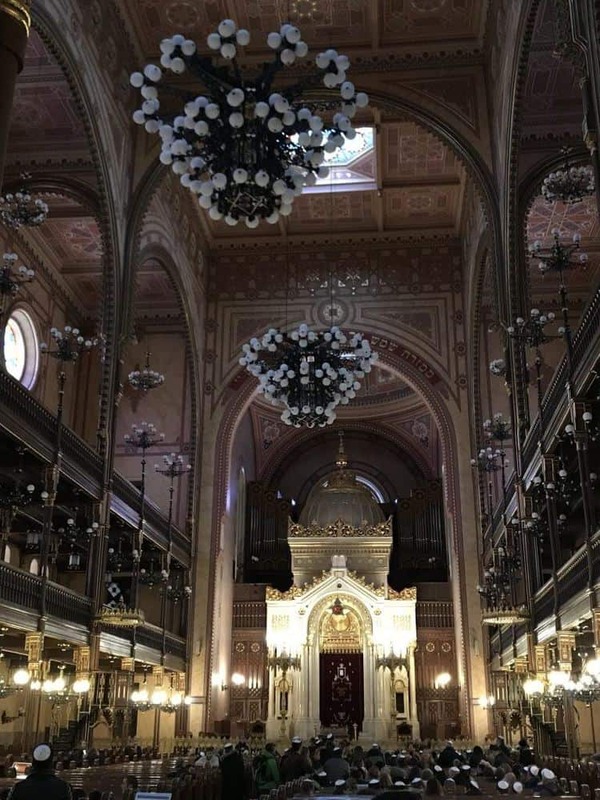 The Great Synagogue on Dohany Street is the largest Synagogue in Europe and the second largest in the world. 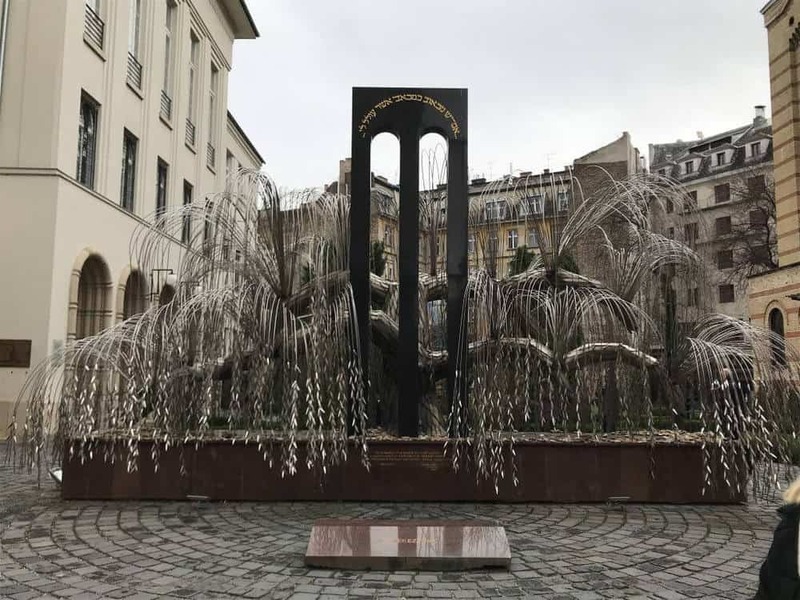 The Synagogue is also home to Raul Wallenberg Memorial Park, a Jewish Cemetery, and a Holocaust memorial with a weeping willow tree with names of Jews killed during Holocaust on each leaf. There is security at the Synagogue, but everyone was friendly and we didn’t have any issues with the stroller. Men must wear a kippah, but paper ones are provided. When you go into the Synagogue, you’ll see seating areas for various languages. A guide will tell you about the synagogue and the history. With a stroller, we took turns listening in but read most of the information in our Rick Steves guide. We popped into the museum for a few minutes and then headed down to the courtyard and willow tree. There is a turnstile to exit, but with a stroller, we had to go back out the entrance. After some sightseeing, we walked out to explore MiniPolisz. 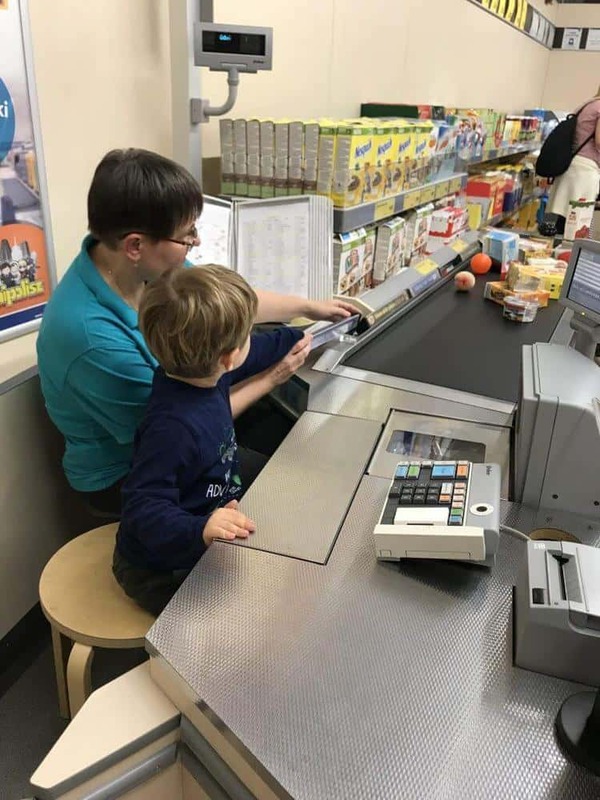 MiniPolisz is a special world where the 3 to 12-year-olds can play with the “adult” things they cannot typically do, such as a cashier, postman, crane manager, banker, florist, machinist, etc. It is open 10am-7pm (Closed Mon/Tues). 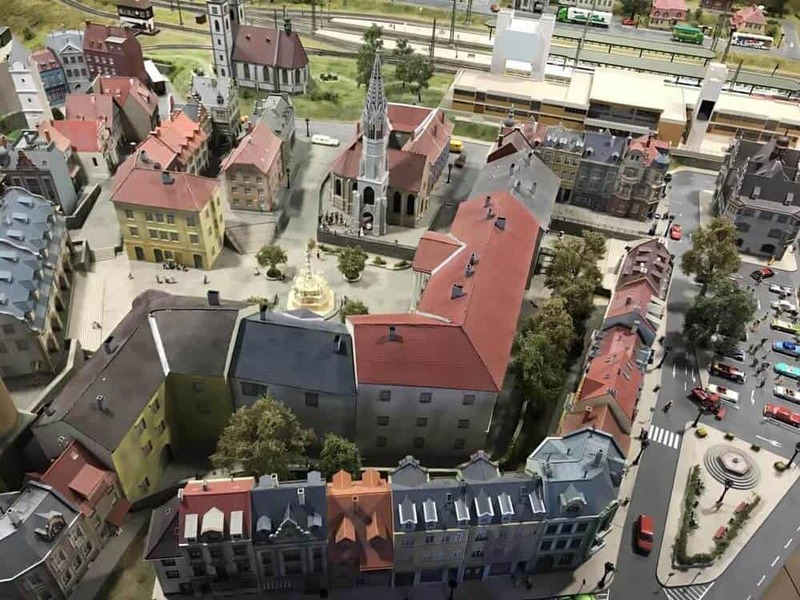 Arrival: Minipolisz is located inside of a shopping zone and a bit hard to find. Go up to the “1st” floor and you’ll find it located about mid-way on the left. There is a small double door entrance. We found space to park our stroller inside and they have cubbies or lockers to store your items. Once you pay for your entrance fee, your off to explore! MiniPolisz was heaven for our son. He really enjoyed getting to “purchase” groceries with the help from the lady working in the grocery store. He also made pizzas, learned how to recycle, rode his bicycle, played firefighter and more. We really liked that MiniPolisz has attendants to keep each section organized and to make sure the kids are having fun. They really engaged with the kids. The Ferris Wheel operates from 10am-12pm and is 2 400 HUF for adults, 1 500 HUF for children between ages 2 -14. Our son really enjoyed the ride and then we headed off to dinner. Sometimes you just need a break from all the “sightseeing” to just play and enjoy. Traveling with kids can be tough and all the walking can lead to some tired feet. We try to travel a bit slower with our son and that means time for play! 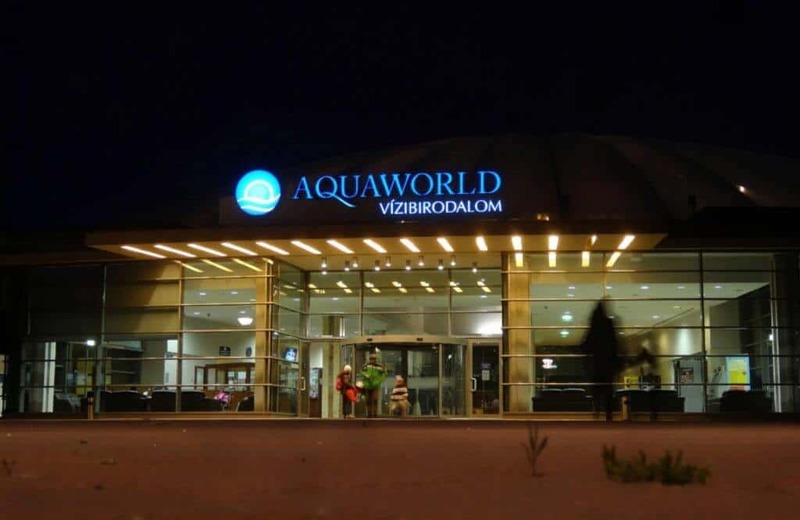 Aquaworld – one of the largest indoor water theme parks in Europe is open every day from 6 am to 10 pm. Here is the shuttle timetable from 2017: Check the website for updates. – The elements of the adventure pools and the slides can only be used from 10:00 am! Once you arrive at Aquaworld, the hotel is to your right and the pool area is to the left. You’ll pay for your tickets and get a digital band to wear during your stay. You’ll use this for your locker and for any purchases. Then you’ll pay for any “extras” when you leave and return your band. Make sure you tell the employee when you enter if you want to purchase towels for your use. You’ll grab the towels before you head into the locker zone. If you’ve never been to a European pool, you’ll see a series of changing rooms. If you have small children, look for family rooms. Pack up all your bags and belonging and find an open locker. Stuff it full and then put your bracelet up against the lock, it will turn a different color and you can turn the knob (or it will self-lock). Then remember the lock number and place the bracelet against the lock again to open it. Remember, if you use your husband’s bracelet to lock it, you’ll need the same to open it. Europeans are pretty strict about taking photos in pools. It’s okay to grab a few photos, but make sure you are conscious of other families. – The ’Wave’ and ’Jungle’ slides located in the children’s pool may be used exclusively by children of 3 to 10 years of age. -Tons of other slides only for adults and kids 130cm (age 14), including a wakeboard zone, funnel tube slides, lazy river, steep drop slides and dark tube slides. -If you visit in the summer, there is also a huge outdoor area with climbing zones, pools and trampolines. Aquaworld Kids Zone with slides, rope bridges, sprinklers and a hidden aquarium. We really liked Aquaworld. There were so many places to explore, the water was warm (a huge plus in November). The staff was helpful and attentive at all the slides and there was a variety for families with children of all ages. The toddler pool is really big with multiple slides, a cave area with an aquarium, bubblers, sprayers and more. There was also a dry kid play zone just outside the water, in case you have a little one that isn’t a fan. My husband and I took turns trying out some of the bigger slides and we enjoyed them all. We did purchase a few snacks in the food area and didn’t have any complaints. Once we finished our visit, we timed our departure for when a bus was coming to pick us up. We took the 6:3opm bus. Make sure you start leaving 30-60 minutes before the pickup time. You need to make sure you have enough time to shower, change, pack up, pay for any extras and then walk from the entrance to the edge of the parking lot for the bus pick up. If you are traveling in the winter, make sure you bundle up well, it’s cold! The bus is a greyhound style bus and was very nice. It was a short ride back to the Square. We took some time to check out Heroes’ Square before heading back to the Airbnb to freshen up. 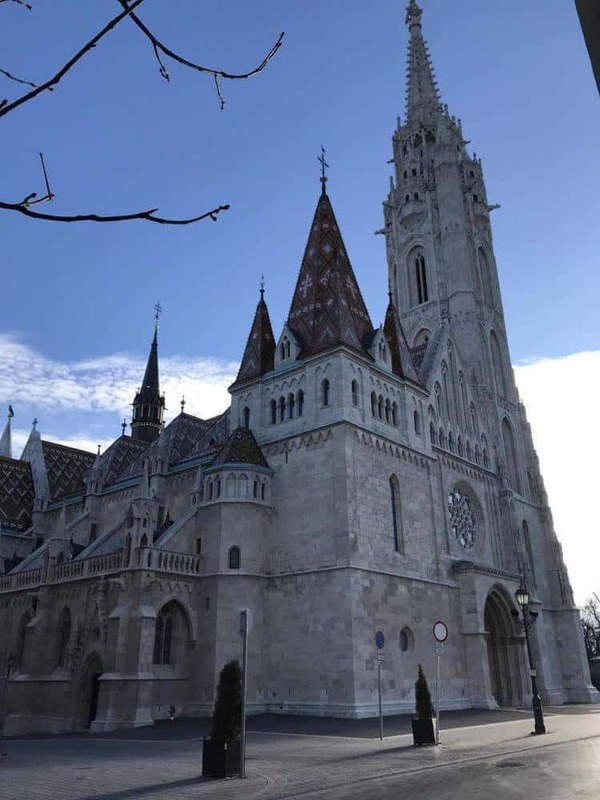 We were staying on the Pest side, which is recommended, so we ended up taking public transportation up to the Buda side and then walking for a bit (hello hills) to reach Buda castle. However, it is probably much easier to take public transportation over to the Funicular, which will take you up the hills into Buda. – Funicular (sikló: takes you up to the Castle Hill from Clark Adam Square) Tickets: 1 100 HUF/adult, (return ticket: 1 700 HUF) 600 for children (return ticket: 1 100 HUF), Operating hours: 7.30-22.00 every day. 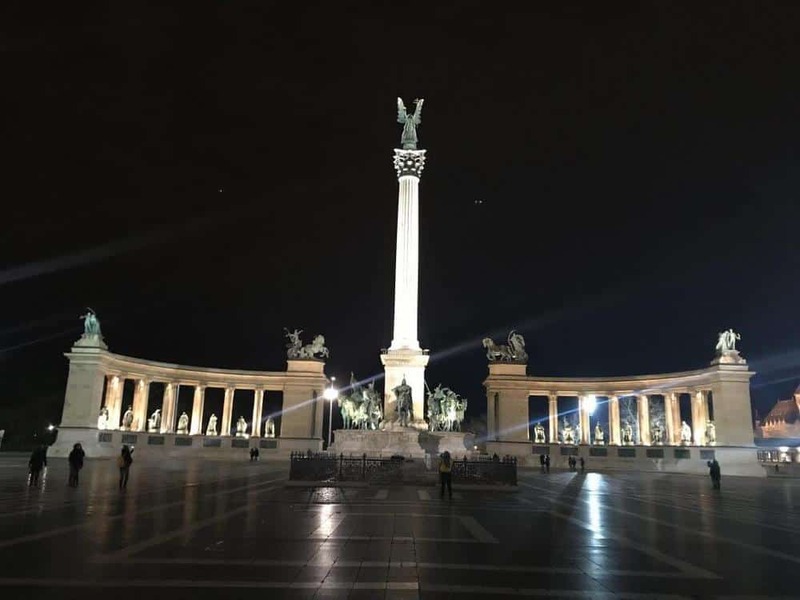 What to see on the Buda side of Budapest? 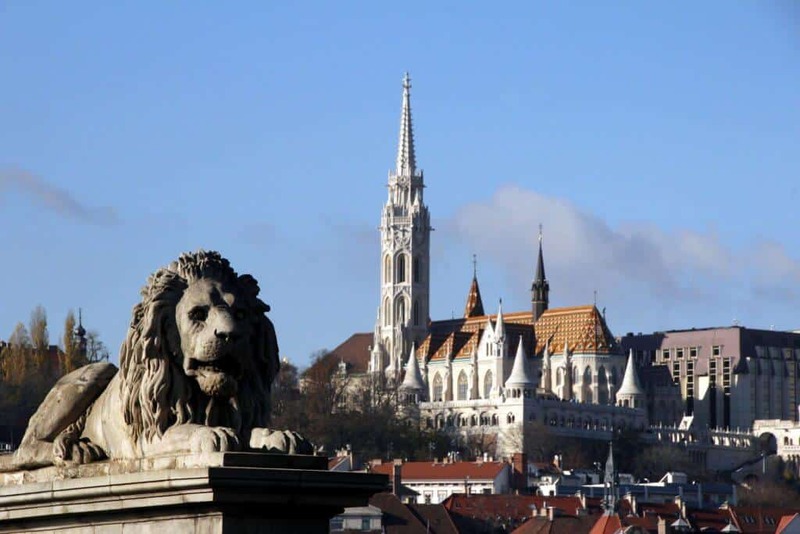 Buda Castle, a visual masterpiece built in 1625 in the Castle District. 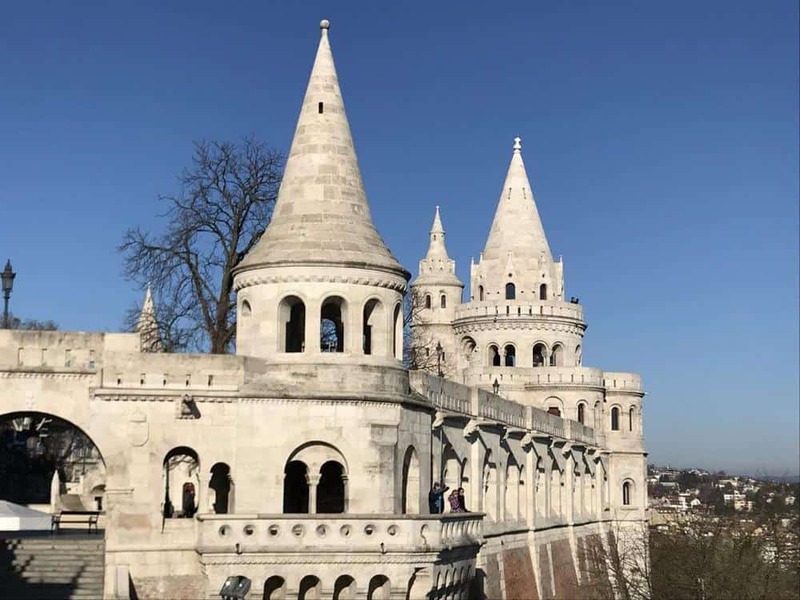 The castle is a UNESCO World Heritage site, and includes the Royal Palace, Matthias Church, Matthias Fountain, a historical museum, Fisherman’s Bastion and a gallery. 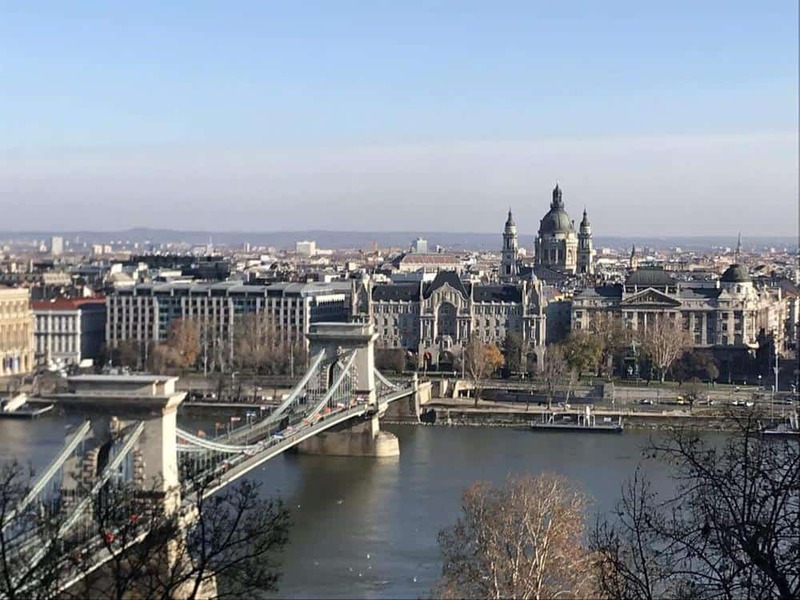 Besides the monuments, you get a breathtaking panorama of the Danube with the Chain Bridge and the Pest side of the city on the opposite side of the river. It was fun to wander around and see the views. This area includes quite a few paid attractions. We did not pay to go into any of them. We just grabbed some hot drinks, did a quick walking tour and people watched. There is a Ruszwurm Confectionery (desert shop) near Mathias Church that is worth checking out if you have a sweet tooth! We had planned to check out the Children’s Railway – run by children (under the supervision of adult railway workers), a fun way to explore the Buda Hills, but the Christmas markets were calling our names, so we decided to head down the hills and finally dive in. You can’t just stroll around the beautiful markets once, so we headed back. I had been eyeing a few purchases and after considering them, it was time to head back and scoop them up! 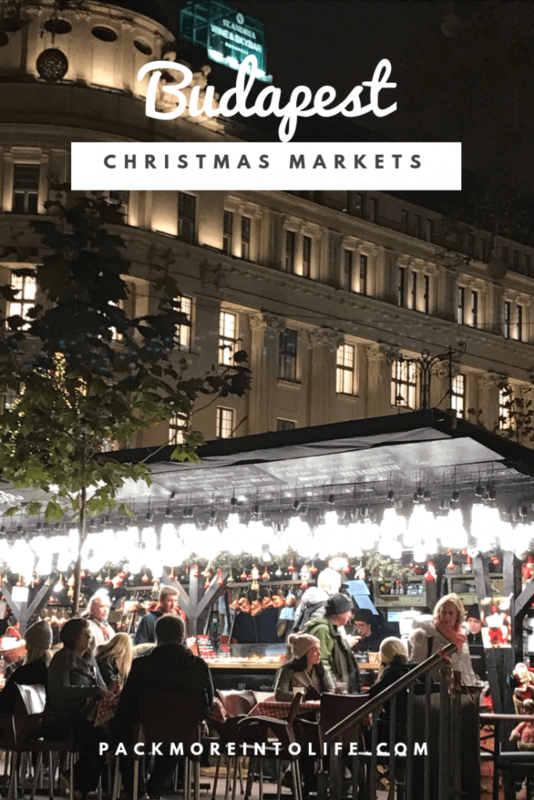 If you want to read more about our time in the markets, head to my Budapest Christmas Markets post or click the image below! 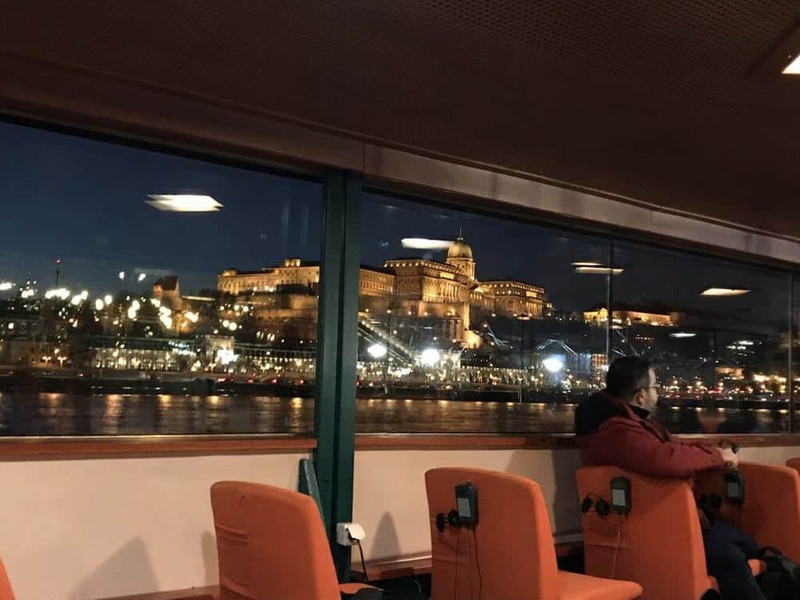 After our Christmas market visit, we booked tickets to go on a Legenda night cruise to see all of Budapest lit up. It was breathtaking and highly recommended. Here is a link to his guidebook. The river cruise was very kid friendly, they even gave our son a drink. You can choose to sit inside (heated) or outside with a blanket. 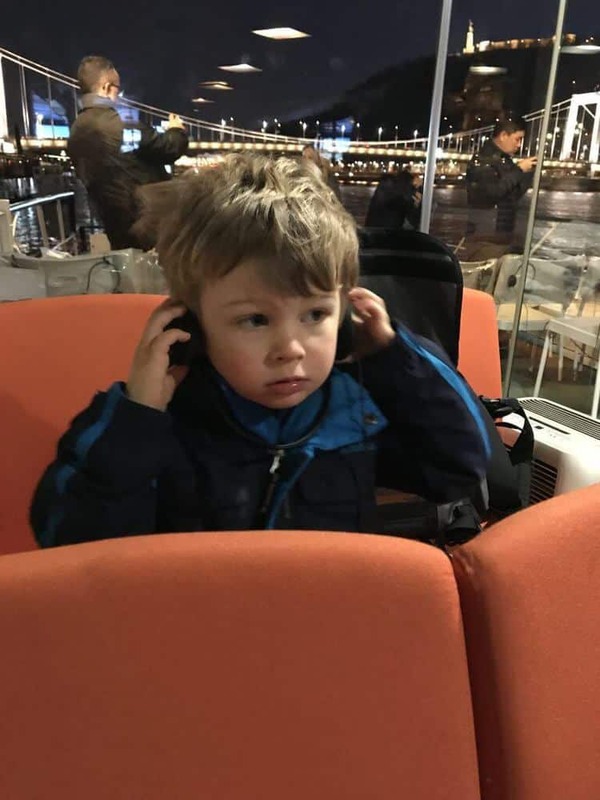 The headsets were entertaining for my son and offered some information about what you were seeing as you cruised up and down the river. Make sure to bring your nice camera to capture the beautiful lights. A big thanks to my husband for braving the cooler temps to step outside for these photos. TIP: Make sure you show up early to board. The seating upstairs offers the best views. The left side of the boat is best since the majority of the time you are seeing the Buda side. This was an additional day to explore for us. We decided to head to the Zoo. We actually don’t typically include zoo visits on our travels because we can visit the zoo anytime in our hometown, but with an extra day and nice weather, it seemed like the perfect outdoor adventure. 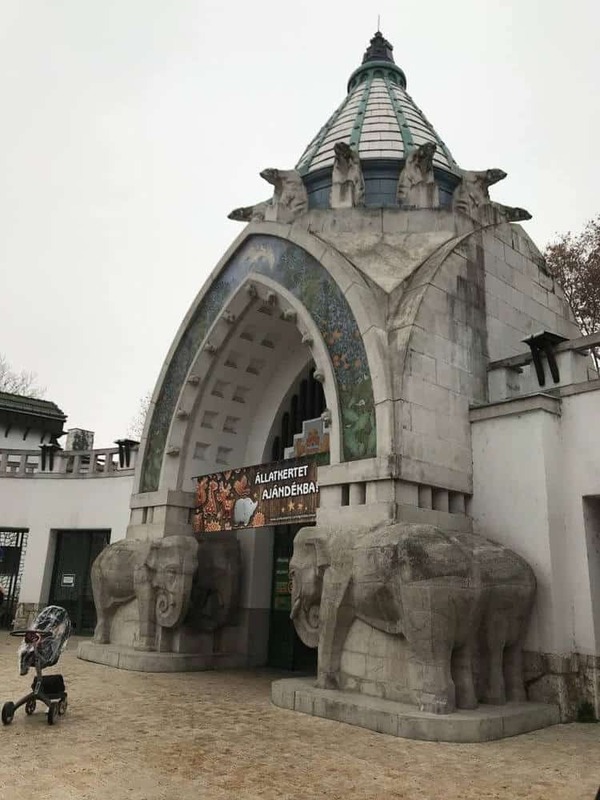 Budapest Zoo is one of the oldest zoos in the world, dating back to 1820 and you can tell when compared to newer zoos. It’s a bit worn down and the exhibit areas aren’t as large or as lush. We enjoyed walking through the exhibit with the animals, giving us a chance to interact with them. 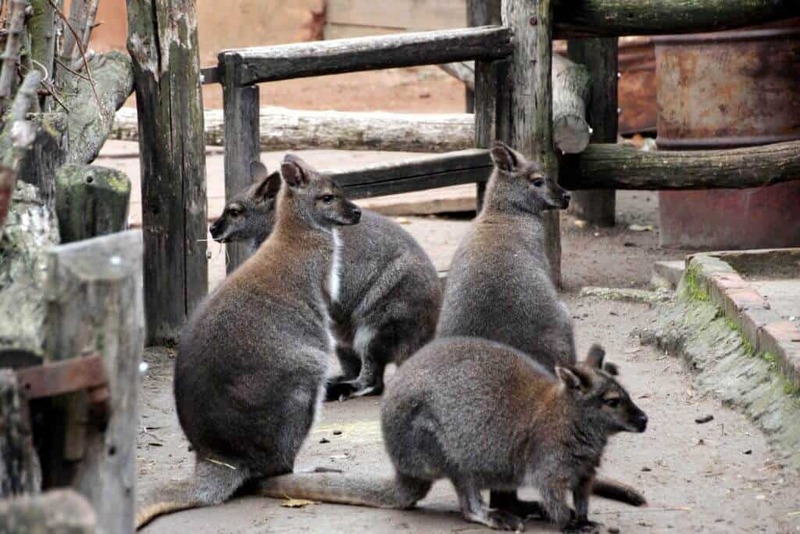 When visiting the Budapest Zoo- don’t miss the ‘Kindergarten’ with various baby animals. We also enjoyed the playground area off to the left as you stroll around the zoo. It had some unexpected fun surprises that gave us lots of giggles. After your visit, enjoy strolling through City Park (Városliget). Established in 1751, it was the first public park in the world, which makes it historically significant for parents, but kids just love it because, well, it’s a park and it has playgrounds! 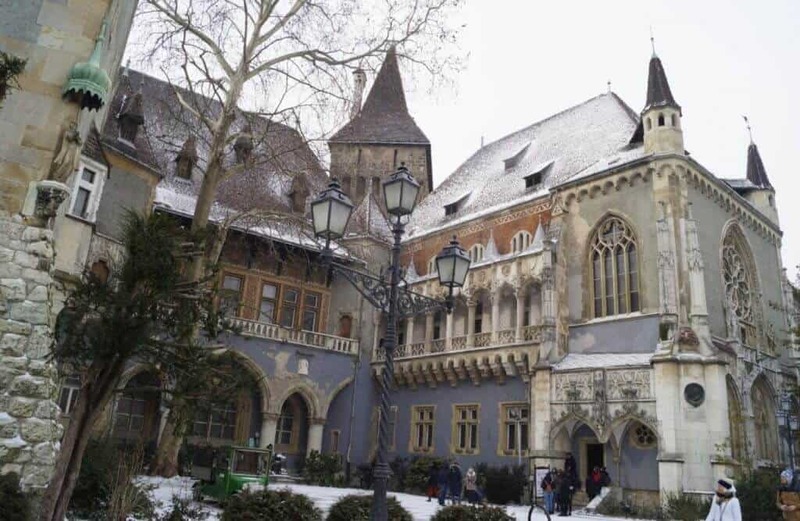 You’ll also stumble upon a Vajdahunyad Castle. 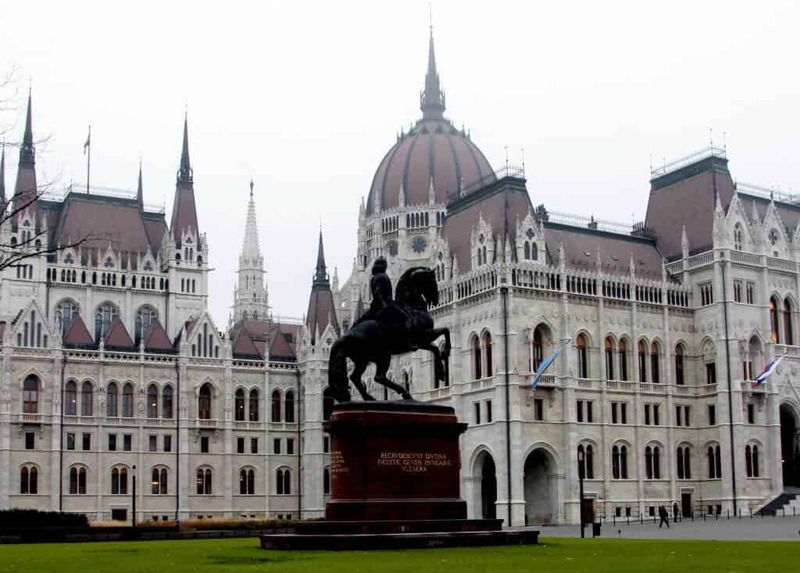 It was built made of cardboard in 1896 as part of the Millennial Exhibition which celebrated the 1,000 years of Hungary since the Hungarian Conquest of the Carpathian Basin in 895. It features different architectural styles: Romanesque, Gothic, Renaissance, and Baroque. It became so popular that it was rebuilt from stone and brick between 1904 and 1908. We enjoyed strolling around the outside of the castle and inside the grounds but did not pay to go into any of the galleries. We spent our evening back in the markets, grabbing dinner, listening to the music and taking in all the ambiance. Budapest was really an amazing city. We loved the fact that we could easily walk to many of the attraction, it was stroller friendly and the city offered many kid-friendly activities/venues. The Christmas markets were amazing! The mulled wine had us coming back for cup and cup. You could smell it from a few stalls away, mulling in the big pots with spices, fresh oranges, and huge cinnamon sticks. If you are visiting Budapest during the Christmas Market season, head to my blog post “Budapest Christmas Markets” to see all the enticing photos and delicious foods! If you come during the winter, check out the Buda Hills, especially the Normafa area, can be lots of fun in winter when thick snow covers the slopes. Normafa is the locals’ number one favorite spot for skiing and sleighing. I’ve heard the inside of the Parliament building is absolutely beautiful. If our son had been a bit older, we would have booked a tour. Something to consider if you have older kids or none at all! A very cool place to check out with kids. We didn’t have a chance to visit, but it was on our list. You can play all the games with an all-day ticket. Perfect if you want to visit, then leave to sightsee and return again that same day for some more fun. 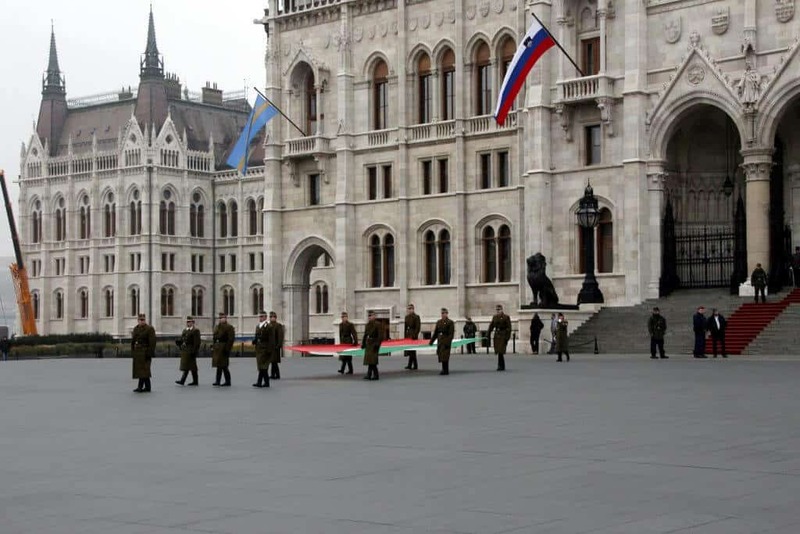 This is usually a highlight for tourists visiting Budapest. 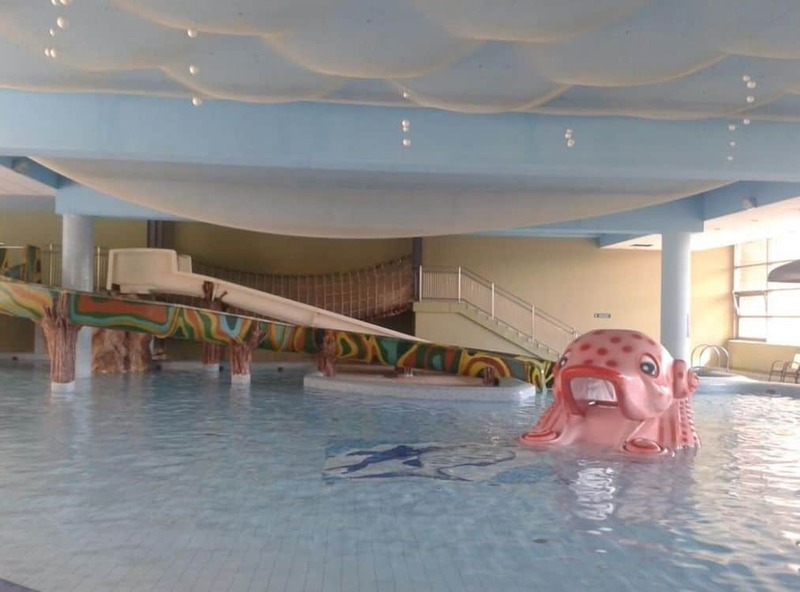 We had planned to partake in a Thermal Spa, but Szechenyi Baths and Pool was doing some repair work on their outdoor pool and we knew the indoor pools wouldn’t work for our young son. I guess that gives us a reason to return! If you want to expand your trip, add on a side trip to Slovakia to explore its many castles! Our friends at “More Passport Stamps” have you covered with tons of amazing castles in one small country. Check it out! Looking for more destination guides and travel tips? Head back to my homepage HERE.